Here are some various predictions for the snow over the next 24 hours. The first map is from Newschannel 5's "Storm5HD" and is their snow forecast. 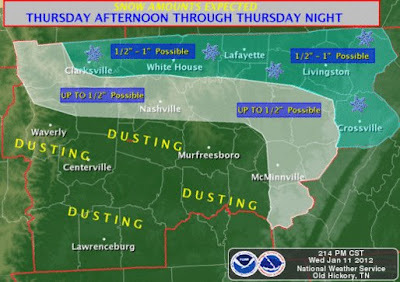 The second map comes courtesy of our friends at the Nashville Weather Forecast Office of the National Weather Service located on the banks of Old Hickory Lake just outside of Nashville. At this point, we believe the changeover will occur in the later afternoon hours. The 'big question' is how much will it snow as the temperatures really nosedive after dark. 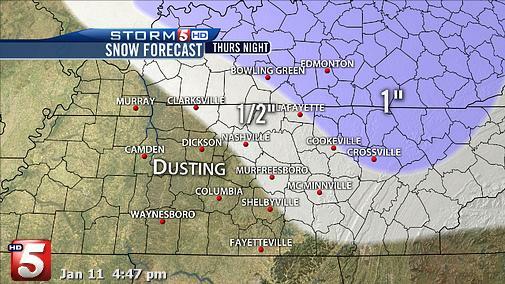 This will determine what shape our roads are in on Friday morning. Due to expected temperatures in the teens by Friday morning, any snow which falls Thursday night will stick to roadways causing some difficult driving conditions, especially across the northern Plateau area of Middle Tennessee. A Winter Weather Advisory is posted to our north and our east and I wouldn't be surprised to see that advisory extend into the Cookeville area on Thursday. Finally, PLAN FOR WINTER WEATHER...leave your home dressed for this event. The howling winds (up to 30 mph gusts) combined with falling temperatures will make the 'feels like' VERY, VERY COLD and it is comical to see people in short sleeves who had NO CLUE anything was about to happen. It bothers me when you see children not dressed properly because their parents aren't paying attention.